The Data Market to Nearly Double in Size by 2019 | What's The Big Data? 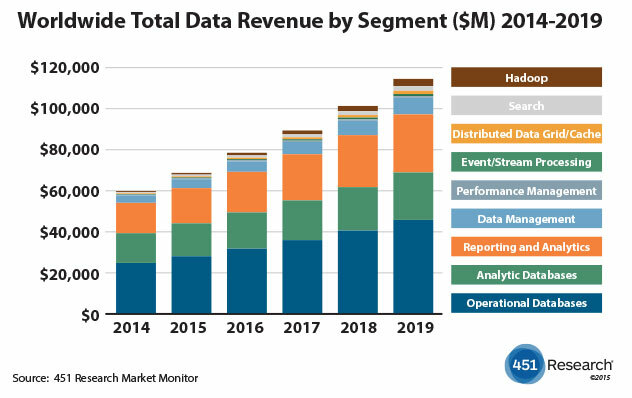 Consisting of data platforms, data management, analytics, and data mining the Total Data Market is expected to nearly double in size, from $60bn in 2014 to $115bn in 2019. The forecast is based on 451 Research’s new Total Data Market Monitor service, which presents data, generated via a bottom-up analysis, of 202 vendors that participate across the nine Total Data segments the company tracks. Specifically, 451 Research tracks 56 Operational Database participants, 26 in the Analytic Database market, 72 within the Reporting and Analytics segment, 41 Data Management vendors, 11 Performance Management vendors, 11 Event/Stream Processing vendors, 9 Distributed Data Grid/Cache vendors, 25 Hadoop vendors and 15 Search vendors. This entry was posted in Big data market. Bookmark the permalink.